Maui celebrates and engages in one of our long held Philippine traditions—fiesta! Fiesta is a long held tradition of celebrating each community’s special qualities. In towns and villages of every size, throughout the island chains, in both the Philippines and Maui, the full embracing of this activity is felt long before the event. Each family member looks forward to the fiesta in a unique way. For the children, it means playful interaction in a carnival setting and competition with peers in a variety of games. For youth, it features a few days set aside to look your best, to create a uniquely appealing fashion statement, different from everyone else, yet so attractive that it makes all heads turn for a deeper gaze, sometimes even hope for sparks of envy. For the women and men with culinary gifts, it provides a venue to show off their most unusual and delicious food innovations, which raise the bar on quality and originality. Musicians, dancers and singers also shine. An attitude of active participation is expected and understood by all. Appreciation for the town’s fiesta activities is demonstrated by the genuine effort given by its leaders to plan for what is historically most enjoyed. Many towns begin with elaborate parades featuring floats representing different villages, school military squads, marching bands, energetic cheerleaders, often followed by enthusiastic crowds. Artistic talent shows up in lavish decorations, the result of many hands working together for countless hours. The queen and her court are chosen through a process of ticket sales over several weeks, culminating in a social box where the generosity of donors determines who gets the most dance—a highly anticipated activity, guaranteed to garner much needed funds for future activities, events and entertainment for the community. Participation, appreciation, and celebration inspire the best in us. A unifying thread is the spirit of Bayanihan, of working as one for the betterment of all—that instill pride in being a Filipino. 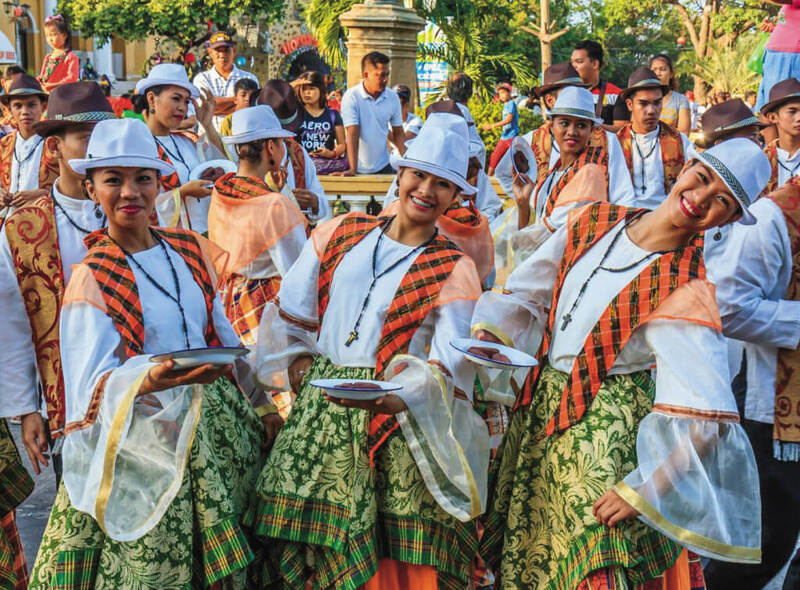 Let us each look back into our fiesta memory banks and smile again, as we relive those cherished moments from another time, which continue to fill our spirits with mabuhay and enrich our souls with warm, meaningful homeland connections. Three cheeers to fiesta! fiesta! fiesta! These young ladies participated in Vigan’s fiesta, held in January of each year, and honor of St. Paul the Apostle. They are shown here holding plates of longganisa sausages.